Appropriation too often spawns a disregard of the responsibilities one has when nurturing the ideas of others into something newly created. The word “adoption” comes closer to describing the level of care one should take when using someone else’s creativity as a basis for their own. Ideally, the process is one of collaboration, where each element is as important as the other. Building upon the ideas of others is a methodology illustrated in this exhibition featuring work by an exemplary group of image-makers. Katrien De Blauwer calls herself a “photographer without a camera”. 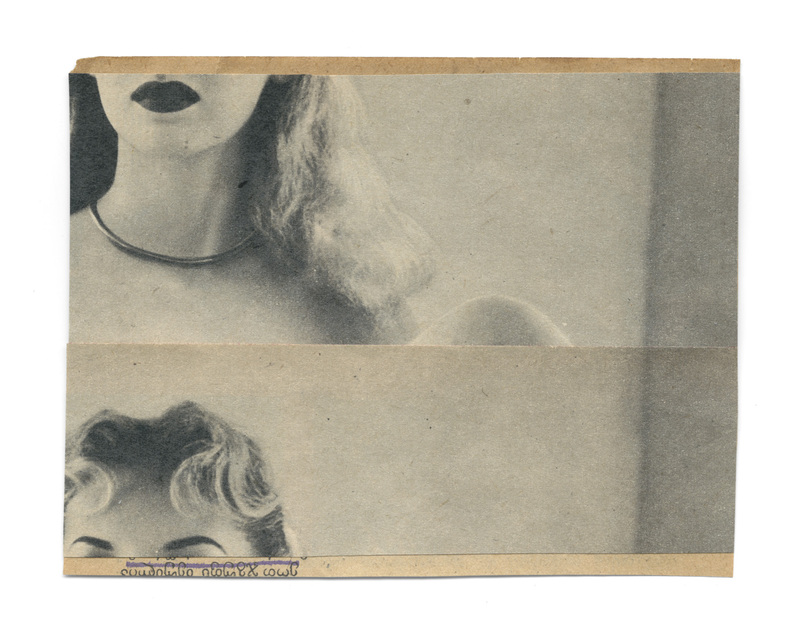 She collects and recycles pictures and photos from old magazines and papers to make collages she describes as small personal histories, a union of autobiography and impersonality where she strives to become a neutral intermediary. Her work brings to mind the procedures of photomontage or film editing, with the cut being used as a frame that marks the essential. Janet Dey is a Toronto-based visual artist who focuses her work on the figure, using various mediums to explore matters of the mind, and its talent for invention and elaboration. Her current body of work, entitled “Rebel Past”, uses prints of old photographic portraits as a surface for her intricate needlework. By stitching these threads, she invites an intimate and startling look at people long forgotten. Gilbert Garcin recycles his own photographs, self-portraits made in various poses, but always under the guise of the “Everyman”. By carefully trimming his likeness into small cut-outs that he positions into dioramas, Garcin depicts struggles large and small, all made with an elegant touch of humour. Stylistically, his black and white prints are influenced by the classic cinema of the 1930s and ‘40s that he grew up watching as a child. Peter Horvath scans images found in magazines, often from advertisements, to make large digital collages that offer a contemporary perspective on Cold War imagery. His newest series “American Century” concentrates on American icons juxtaposed against the South-Western landscape. Although this combination of imagery historically creates a stereotypically patriotic feeling, Horvath’s use of the material stirs more melancholic emotions when viewed through this nostalgic lens. Sanaz Mazinani downloads images from the internet and uses digital methods to replicate and mirror them into elaborate patterns that often reference Persian ornamentation. These large patterns are usually comprised of only a few photographs that are rendered abstract when seen at a distance, but which retain their impactful detail when viewed up close. In her series “Forever in the Sky”, careful examination of these long scrolls reveals a bright sky adorned with clouds, dotted with tiny warplanes and their entrails. Alison Rossiter has produced a celebrated body of work that uses darkroom skills to coax beautiful abstract images out of long expired photographic papers. The images we enjoy are the result of circumstantial aging to the papers’ organic matter, made visible and permanent by chemistry. In her series “Camera Work Replacements”, she uses remnants of the famed Camera Work publication as backdrops for her abstract photographs. Over time, discreet traces of the magazine’s plundered photogravures are rendered on the opposite page as a mirror image. Rossiter then pairs these pages with work on contemporaneous papers to breathe new life into their old settings.